In celebration of our 15th anniversary, we collected 15 stories from friends, family, and staff. Go here to read about the adventures we're gotten ourselves into, and join us to be part of the stories of the next 15 years! The 2017 Forest to Faucet teacher workshop offered two days of hands-on place-based teacher training designed around the children's book My Water Comes from the San Juan Mountains! Participants spent time in the field with expert guest speakers, went on field visits to rivers, reservoirs, and water treatment plants, and learned new student activities using the My Water Comes from the San Juan Mountains book, teaching kit, and curriculum guide. Traveling from headwaters to intake so that they could better understand the journey detailed in "My Water Comes from the San Juan Mountains", teachers started by examining macroinvertebrates in the Upper San Juan River to assess water quality. Who participated? Fifteen teachers from seven schools (Dolores Elementary, Juniper School, Bayfield Elementary, Mesa View Middle, Montezuma-Cortez High School, Pagosa Springs Middle, Park Avenue Elementary) and two environmental programs (Audobon Rockies and Ute Mountain Ute Environmental Programs). Here, teachers use an index to identify the macroinvertebrates they find. The knowledge they gained will help them to teach from the associated "Macroinvertebrate Mania" lesson plan. Steve Hartvigsen shares a wealth of knowledge from his lifelong service with the USFS. This forest lecture focused on the relationship between forest health and water quality and quantity. The Forests to Faucets Workshop offers hands-on, relevant activities that equip educators with up-to-date knowledge of local watershed science and provides them with engaging tools for bringing that knowledge back to their classroom. Upon integration of the curriculum into their classrooms, it is estimated that these teachers will bring watershed science to an additional 300-450 students per year. Additionally, the workshop offers graduate credit (in the form of continuing education credit) from Fort Lewis College, helping to grow the credentials of our local teachers. By offering this workshop to local educations, F2F build teachers’ capacity for teaching watershed science across the region by providing place-specific knowledge and activities that can easily be integrated in science, math, and social studies curricula. This program would not be possible without the support of Alpine Bank, The Ballentine Foundation, The Community Foundation Serving Southwest Colorado. If you're interested in signing up for future F2F workshops, contact amanda@mountainstudies.org. Four weeks ago, I began this internship seeking experience in environmental education and field work. So far, I have gotten just that. In just the past two weeks, I have worked with over 40 students from 5 to 15 years old. The students' enthusiasm and curiosity has blown me away and made me even more excited for the programs that lie ahead. Last week, Amanda Kuenzi and I guided 15 Boston middle-schoolers around Durango and Silverton. After students spent a day practicing macroinvertebrate sampling in Junction Creek, we designed an experiment to test the effects of pollution from cement creek on the macroinvertebrate community downstream. The students jumped in to the project with enthusiasm, quickly gaining an understanding of the complex interactions that oxygen, temperature, pH and particulates play in overall stream health. During our final day with the group, we switched from aquatic to terrestrial ecology. Among the verdant slopes and raging waterfalls of Cunnigham Gulch, we documented signs and sightings of American Pika, a temperature-sensitive species that is considered one of the best early indicators of changing (warming) climates in the US. From there, we drove up South Mineral Creek Road, stopping at beaver dams to discuss the ecosystem services of wetlands. During our final hike up the Ice Lakes Trail, I was amazed to hear students point out Douglas fir and native flowers after they had spent only three days in an entirely new ecosystem. Last week, we switched over to working with younger, local students at Silverton School. Every year, Mountain Studies Institute leads three days of Ecology Camp for the students. We spent our first day in the school garden. Kay Phelps, kicked off the camp with a discussion on seeds and their different mechanisms of dispersal, from dandelions that blow in the wind to grass seeds that stick to your socks. We also dissected lima beans and identified all the parts of a plant contained within the tiny seed coat. Next, students each chose a flower to examine and draw with a "scientist's eye and an artist's hand." After reviewing the life cycles and needs of plants, we dug into the soil and planted seeds. Each team tackled an area of the garden, planting radishes, kale, edible flowers, carrots, chard, peas, and more. Our second day together was even more exciting than the first; the younger group, grades K-3, examined benthic macroinvertebrates with awe, exclaiming that they "never would have imagined there are so many little animals in the river!" The older students, grades 4-8, spent the afternoon in Cunningham Gulch learning about glacial geomorphology through sand sculptures with MK Gunn of San Juan Mountain Association. During our third and final day, the younger group focused on trees while the older ones got their own time with macroinvertebrates. The young kids were quick to figure out the stresses caused by overcrowded forests, droughts, and floods when we played "Every Tree for Itself." With both groups, we created a display town to explore watersheds and pollution. Each student had the chance to help build the town, identify pollution, create rain to wash the pollution downstream, and identify solutions to pollution. Although I know I have so much more to learn about education, I'm amazed at how well everything has gone thus far. My initial fears of failing to teach the students feel far away now. One student even asked, "how do you come up with so many creative, fun activities for us?" I am grateful to have had the expertise of Amanda, Kay and MK as we planned and implemented the lessons for the last two weeks. I'm hopeful the next seven weeks will be as impactful and rewarding as the first four. "In a region of the state where mining legacy is big business—both as an active industry and as an offshoot of tourism—it is not surprising that more than 150 people attended the seventh annual San Juan Mining Conference in Ouray last week..."
Read the full article from the Ouray County Plain Dealer. MSI's Executive Director, Marcie D. Bidwell appears as an author in a peer-reviewed publication released in July 2015. Click below to read the full peer-reviewed publication. an economic opportunity that attracted people to take residence in this harsh environment and build a lifestyle that centered on extracting minerals from the mountains. To understand the complete impact of the Gold King Mine spill, we must understand the legacy and future of mining in the San Juan Mountains, and the reclamation of mining disturbances to ensure a healthier ecosystem. The Gold King spill, while terribly alarming in and of itself, is not an isolated occurrence. More than anything, it highlights the need for mine reclamation in the San Juan Mountains. The San Juan Mining and Reclamation Conference provide an opportunity to discuss, educate and collaborate on the importance of clean up and reclamation of abandoned mines, like the Gold King, for public health. There are hundreds of mine adits, just like the Gold King that leak contaminated water into Cement Creek, and thereby the Animas River, every day. The importance of clean up and reclamation of all our upstream mines on water quality was horrifically apparent this month, but serves as a reminder of what we are silently contending with every day. You can learn more about the legacy and future of mining in the San Juan Mountains by visiting our website: www.mountainstudies.org/sjmrc, and by watching the SJM&RC videos available through our website and utube: MountainstudiesCO. Consider attending next year’s mining conference to learn more about the issues we face and the ways that we have begun to address these problems. Thank you very much to all of the sponsors of the 2015 conference that made it possible to bring you this unique two-day educational opportunity to learn more about the region in which we live. Officials estimate about three million gallons of wastewater spilled into the Animas River. 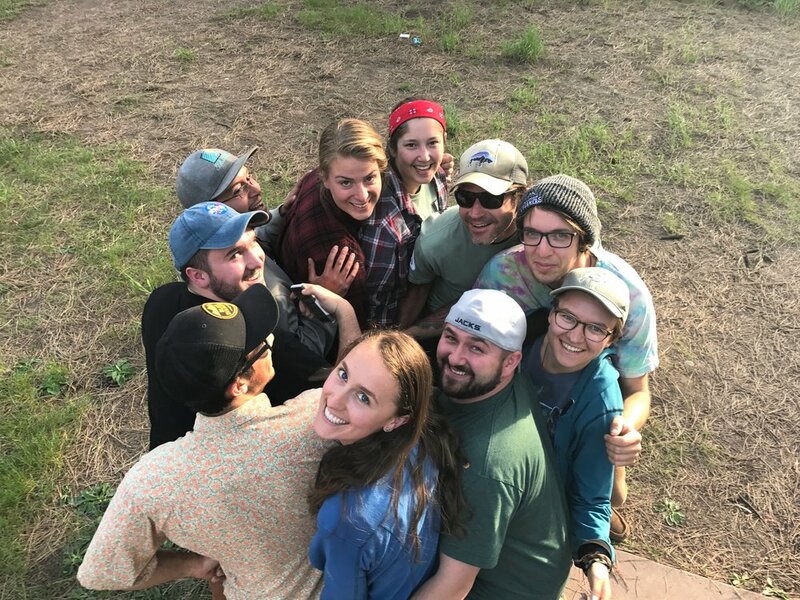 The San Juan National Forest and Mountain Studies Institute has won a U.S. Forest Service award for launching a program to offer college students experience in resource management. The Four Corners Federal Land Internship Program puts students to work alongside Forest Service and National Park Service staff. Read full article in the Durango Herald. From the Durango Herald, March 4th, 2015: "Marcie Demmy Bidwell, executive director of Mountain Studies Institute, and Renee Rondeau, a conservation biologist with Colorado Natural Heritage Program at Colorado State University, are scheduled to speak at the Green Business Roundtable next week. They will address future scenarios and the ability of businesses to adapt to the economics and ecological conditions." Courtesy of David Singer. The Sound Democrat Mill, thanks to stabilization efforts in the 1990s, now sits intact on a hillside on Placer Gulch northeast of Silverton. Top: The Sound Mill was crumbling before stabilization work. From the Durango Herald 2/8/15: History Colorado, through the State Historical Fund grants program, last week announced 24 grants for historic-preservation projects. The Sound Democrat, located in Placer Gulch not far from Animas Forks, was among those to get a piece of the $3 million pie. Read the full story here. Marcie Demmy-Bidwell, director of Mountain Studies Institute, plants plugs of grass near Ophir Pass. The institute recently received a grant from the AirWaterGas Sustainability Research Network based at the University of Colorado Boulder. It will be holding discussions across the region on the relationship between water and energy. The Durango Herald 2/5/15: Two local groups will work with researchers over the next year to monitor pollution and spread awareness about new air-quality regulations. Their work will be made possible thanks to two $5,000 grants from the AirWaterGas Sustainability Research Network based at the University of Colorado Boulder. Read the full story here.